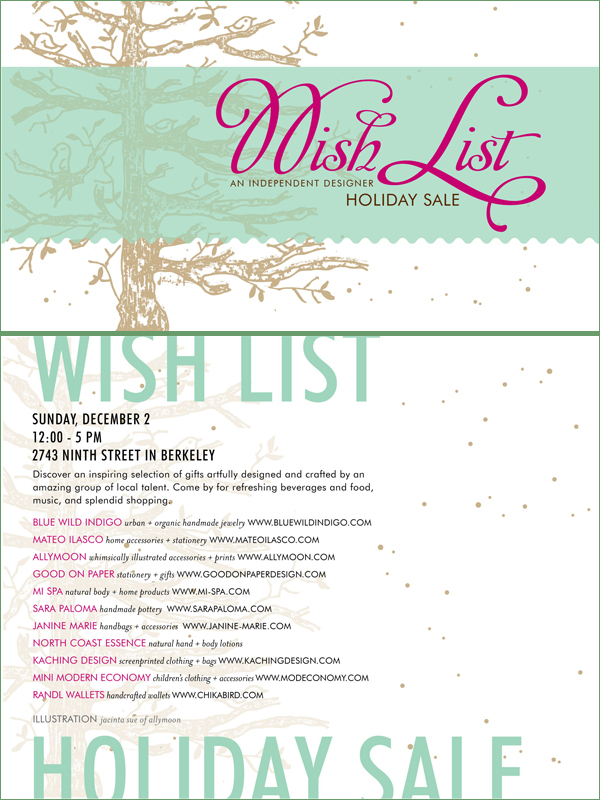 Hey, if you're in the Bay Area this weekend, come to our holiday sale to cross all those names off your shopping list! Ok, go to the bookstore. Barnes & Noble or Green Apple Books? It doesn't matter. Now, pick up a copy of Adorn magazine. No, not J'Adore Magazine!! Come on now. Alright, flip to the last page. And voila, you'll see me. Well, me with longer hair. It doesn't look like that anymore. It's like chin-length now with longer pieces in the front. And I often tie it back into a retarded two-inch ponytail. Like you care. 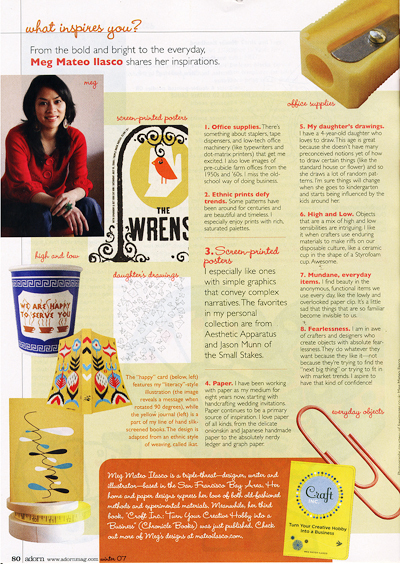 Anyway, I'm in the magazine talking about things that inspire me! Neat. Well, I've been sorta out of it for a couple weeks. Can you tell? I was sick for a while and throughout all the book events in LA, too. I'm sorry if you met me and I coughed on your copy of Craft Inc. I know, that was terribly rude and disgusting, not to mention saliva makes ink smear. Now that I'm all recovered and rested, I just want to crawl under a rock and sleep. It's been so exciting and so tiring all at the same time. 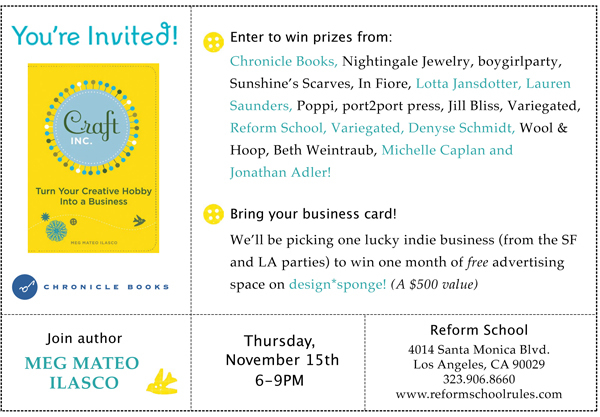 Thank you to everyone that came out for the Reform School event on 11/15. It was so much fun meeting everyone. And I must say, those Reform School ladies sure know how to throw a party--down to the m&m's that matched the colors of the Craft Inc book cover. I wish I had some pictures to share, but I don't own a small portable digital camera. And Walgreens refuses to develop my 110 film. I know, it's 2007, I need to get with it already. Thank you to Jenny Ryan for her craft demo and for inviting me to speak at Felt Club the following Saturday. I'm sorry I was a tad bit late for my talk. Dude, blame Southwest Airlines. They had me shuffling around different gates all morning. I also wanted to announce that I've picked a winner (actually my studiomate Carolina picked it) for the design*sponge month-long ad! And winner is (drum roll, please): Jennifer Chee of Jakc Designs. Woohoo! Congrats. 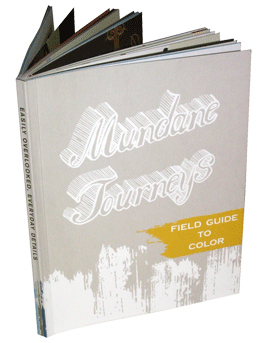 On our visit to Park Life last week, Grace and I came across this little jewel of a book called "Mundane Journeys: A Field Guide to Color" by Kate Pocrass. It's a cool little guidebook of San Francisco that takes you on a tour of the "easily overlooked, everyday details" in the city--from sending you to a corner on Geary and 18th to admire posters to going into building to stare at the floor numbers. It gives you an alternative, color-infused look at the city and an appreciation for the endless discoveries around you if you just paid more attention. 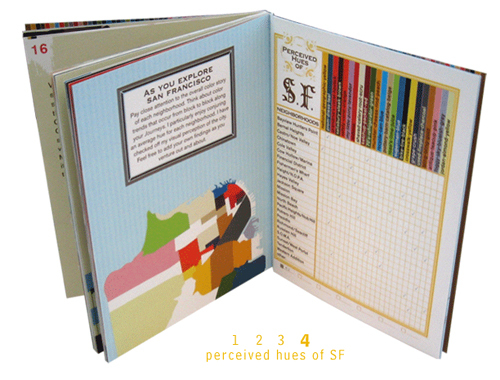 Best of all, supported by a grant from the SF Arts Commission, the book is only $5. We found the book late in the day, so Grace and I didn't have a chance to embark on any mundane journeys. Darn. To learn more about Kate's project: go to her website. She also gives bus tours and if that wasn't enough, she has a hotline you can call if you're just itching for a new mundane mission. Seriously, every city should have a guidebook like this. Hopefully Kate will expand into other cities!